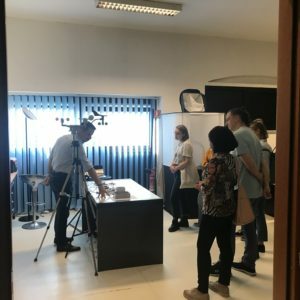 On October 16th 2018, CRS4 welcomed an international delegation of 55 students and high school teachers, led by Prof. Rita Gentili of the Euclide high school in Cagliari, partner of the Erasmus plus Ka2 project "Visions of European cities" for a cultural exchange with project the Tessuto Digitale Metropolitano/Metropolitan Digital Fabric on the theme of urban sustainability. 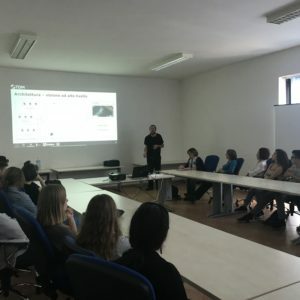 The visit, which took place in Pirri, comprised a general presentation of the TDM project and the demonstration of main applications developed: technologies for the widespread sensor technology, citizen safety from environmental risks, energy awareness and scalable visualization of large volumes of data. The initiative will open up opportunities for future collaborations on experimentation activities already foreseen by the TDM project at some schools in the metropolitan area of Cagliari.